The Axis of the goniometer should be places at the lateral epicondyle of the femur. The moving arm should point towards the lateral malleolus and the stationary should point towards the greater trochanter. The Passive knee extension test has good intra-tester reliability [ICC: 0.97-0.98]. ↑ Fredriksen H, Dagfinrud H, Jacobsen V, Maehlum S. Passive knee extension test to measure hamstring muscle tightness. Scandinavian journal of medicine & science in sports. 1997 Oct 1;7(5):279-82. ↑ Reurink G, Goudswaard GJ, Oomen HG, Moen MH, Tol JL, Verhaar JA, Weir A. Reliability of the active and passive knee extension test in acute hamstring injuries. The American journal of sports medicine. 2013 Aug 1;41(8):1757-61. ↑ Reese NB, Bandy WD. Joint range of motion and muscle length testing. Elsevier Health Sciences; 2016 Mar 31. ↑ Nelson RT, Bandy WD. Eccentric training and static stretching improve hamstring flexibility of high school males. Journal of athletic training. 2004 Jul 1;39(3):254. ↑ Davis DS, Quinn RO, Whiteman CT, Williams JD, Young CR. 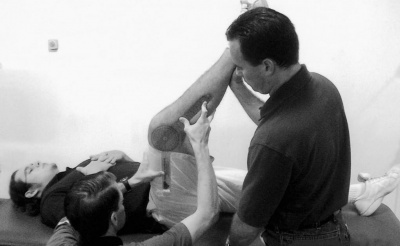 Concurrent validity of four clinical tests used to measure hamstring flexibility. The Journal of Strength & Conditioning Research. 2008 Mar 1;22(2):583-8.